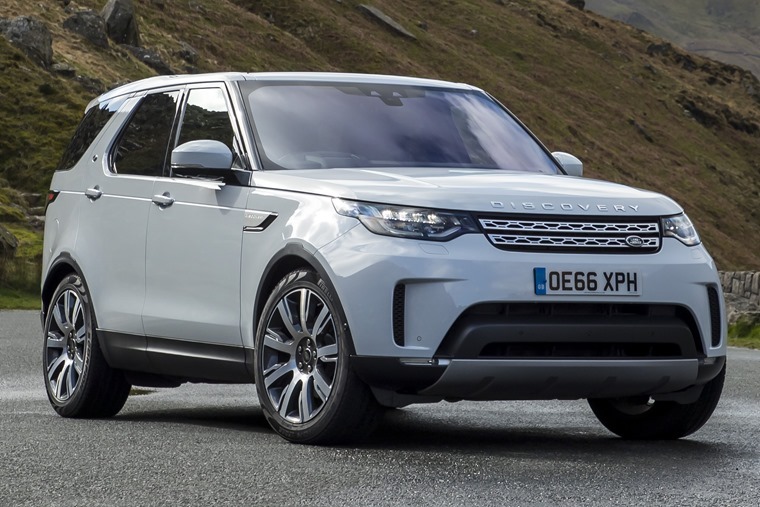 Casually labelled as the ‘digital’ Discovery, Land Rover has binned much of the relatively archaic technology that underpinned the outgoing model and replaced it all with cutting edge tech. This is a car that is all things to all people. 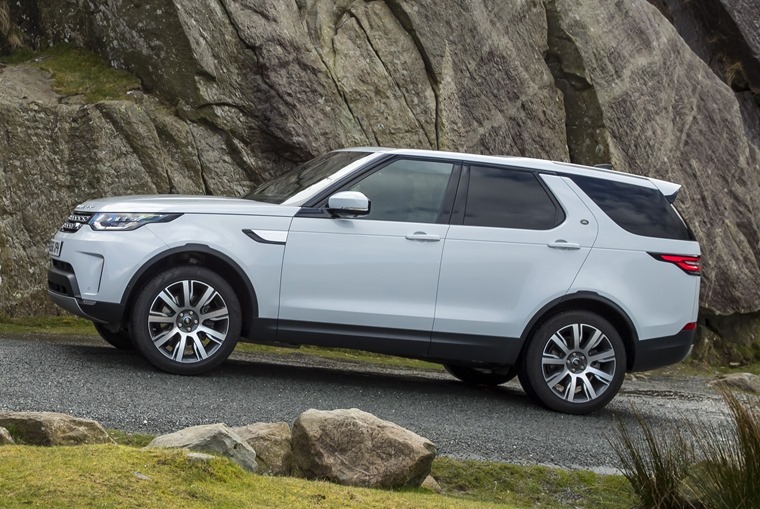 Slimming down the Land Rover Discovery shouldn’t have been be too difficult, which explains how the engineers at JLR have managed to shed almost half a tonne from the car. However, such is the bulk of the Disco, that still leaves 2.2 tonnes or so of metal to be lugged around. That bulk makes the Discovery feel unstoppable, something we put to the test at Eastnor Castle, home to Land Rover’s demanding off-road customer driving experience. Rock crawls that would be tricky on foot, deep water that would leave any that would defeat almost anything on the road, deep water well beyond the bottom of the door, and bumps that twisted the suspension to extreme angles proved inconsequential to the new Discovery, but it’s what’s going on underneath the skin that’s impressive. Land Rover has binned much of the relatively archaic technology that underpinned the outgoing model and replaced it all with cutting edge tech. 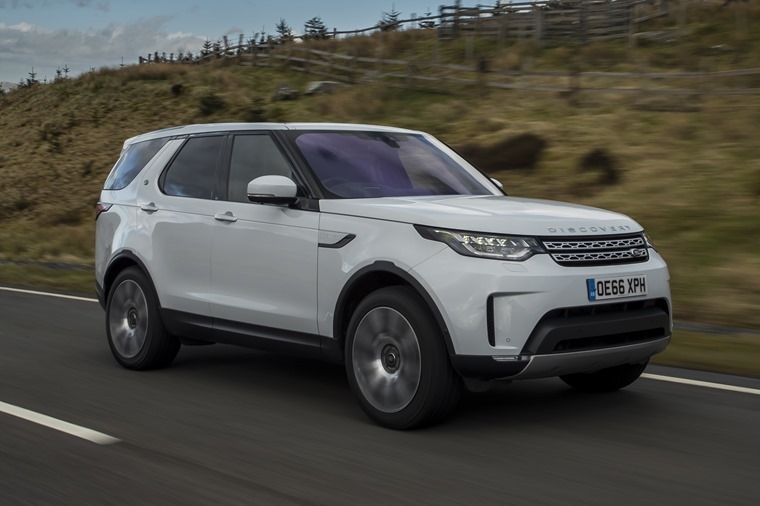 Casually labelled as the ‘digital’ Discovery, Land Rover has binned much of the relatively archaic technology that underpinned the outgoing model and replaced it all with cutting edge tech. Take the vehicle off-road and that rotary dial on the centre console switches between drive modes. There’s sand, snow, mud and ruts, and so on - is rendered pretty much obsolete. 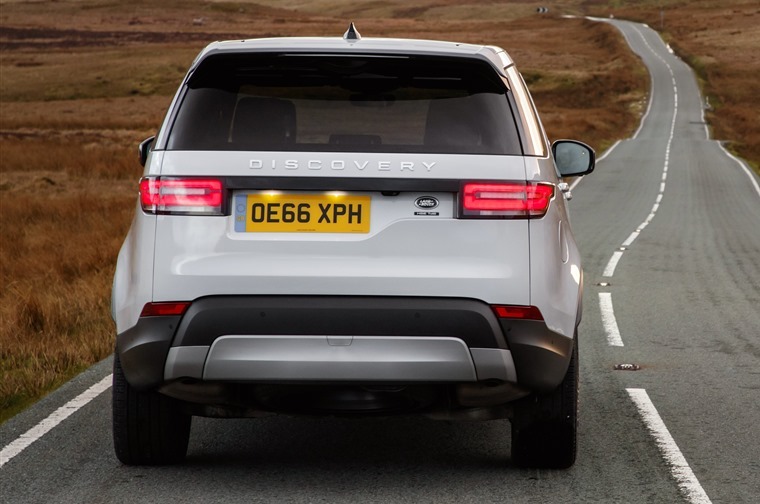 The Discovery reads the road surface and can automatically change the drive mode multiple times each second, the Terrain Response system ultimately finding the right mode for the road better than the driver. There are plenty of other aids to keep you on the right (muddy) tracks, including the All Terrain Progress Control. This is effectively an off-road cruise control system for when you’re concentrating on just keeping control of the car. 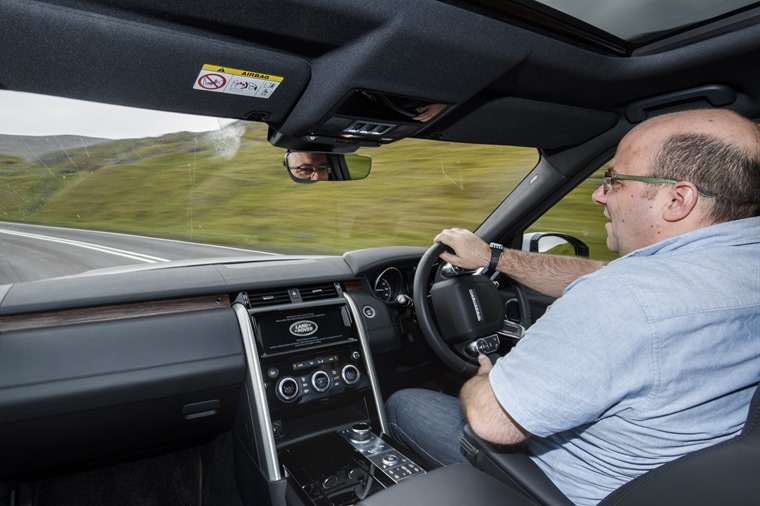 It allows the driver to set a very low speed that the Land Rover will simply try to maintain at all times, removing the need for the driver to concentrate too much on tiny throttle and brake applications and concentrate purely on steering. It sounds crazy, but it works well and will be a boon to those that venture away from the tarmac just occasionally. On a motorway cruise it’s lovely, with that air suspension doing a pretty decent job of masking the bumps. For the rest of us who remain firmly on-road, the Discovery can’t hide its bulk. When you get to a corner and turn in, expecting 2.2 tonnes of metal to follow the prescribed line both immediately and accurately is perhaps asking a bit much, but the Discovery has a good stab at it. There is actually a decent amount of grip available, and electronic air suspension helps to keep body roll in check a little, but it’s not elegant when pushing hard. A Volvo XC90 does it better, but the Land Rover is right behind it. On a motorway cruise it’s lovely, with that air suspension doing a pretty decent job of masking the bumps, despite 21-inch wheels being fitted. There’s a 3.0-litre V6 diesel engine under the bonnet of this test car, producing enough power to propel the Discovery to 60mph in just 7.7 seconds, that suspension lowering the car towards the road surface as it detects more enthusiastic efforts. It doesn’t actually feel that quick though, in the same way as an Airbus A380 appears to be gliding slowly along as it thunders towards a runway at 180mph; the cabin isolates you from the outside world so effectively that normal reference points disappear. A 10in touchscreen dominates the centre stack, but that’s enabled Land Rover to minimise buttons on the dashboard. 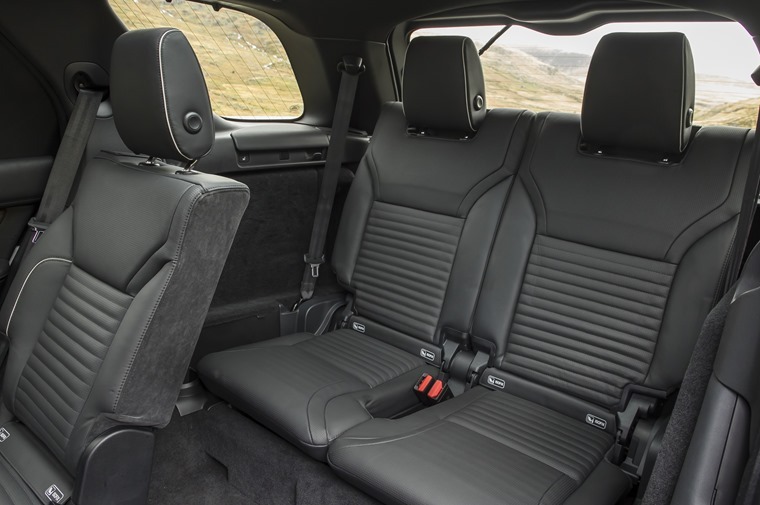 It’s got all the necessary connectivity, including a built-in wi-fi system that can support six devices in the car - coincidentally the same number of passenger seats, if you exclude the driver. The interior is wrapped in acres of leather, sheets of polished metal and plenty of high-gloss plastic. There’s nine USB ports dotted around, so everybody’s phone can stay fully charged. Pleasingly, there’s still knobs for temperature and volume, so the basics can be carried out by feel alone. It’s all wrapped up in acres of leather, sheets of polished metal and plenty of high-gloss plastic, to give an air of luxury. They all get plenty of space, too, with even the pop-up sixth and seventh seats being able to accommodate an adult, although they won’t thank you for putting them there on a long journey. All six passenger seats fold up and down at the touch of a button, and there’s even an app to allow you to do it remotely. That could be handy when you go to Ikea for a shelf and return with a set of Billy bookcases. All six passenger seats fold up and down at the touch of a button. With everything folded down there’s a massive 2,406 litres of cargo space, accessible through a boot lid that includes a slide out platform. The rear suspension can even be lowered to make access even easier. Storage bins and pockets are dotted around the car, with one hidden under the central cupholders that could hide enough Haribo to keep six kids happy for days, and there’s even a small cubbyhole hidden behind the air-con controls. It seems like this Discovery is all things to all people then, and that includes the engine. Yes, there’s a smaller 2.0-litre unit that probably makes more sense, especially as it’s barely any slower than the 3.0-litre - it loses just 0.3 seconds on the 0-60mph sprint - and a little more frugal, but the small uplift in price for the refinement of the V6 is tough to argue with. It seems like this Discovery is all things to all people then, and that includes the engine. Only the styling seems to divide opinion. The Range Rover inspired design has street presence, but it doesn’t portray the same kind of indestructibility that the clean-cut utilitarian style of the previous generation did. And then there’s that offset number plate. Mark that down for the facelift in three years. Pricing raises a few eyebrows too. For cash buyers, savings north of £60,000 would be needed for this test car, and that’s before the £15,000 or so of options that have been fitted to it. The flip side is that expected low depreciation will keep leasing costs down, with some dropping below £600 per month, which makes it more accessible. That can’t be bad for a car with all the style and panache of a Range Rover, but the ability and more of a Land Rover. *Average monthly lease rates calculated using ContractHireAndLeasing.com data and based on typical 6 + 35 10k deals. Prices may not be representative of the model in this review. Correct at time of writing.